Here are some ideas and suggested prayers for celebrating the feast day of the Holy Innocents. 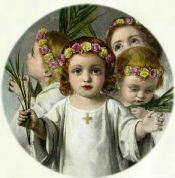 December 28 is the feast of the Holy Innocents, the feast for all babies. In our own baby is imaged the babes of that dreadful slaughter, and no parent can look at his own baby this day, remember the Innocents, and fail to know the anguish of their parents. It is the Innocents' parents one remembers when standing over the bed of a fevered child keeping a night's vigil. Little ones have always held the center of the stage on the feast of the Holy Innocents, some crowned as kings, some as boy bishops, some in convent schools as superior this day; there were processions and games and feasts all to their choosing. Perhaps we know someone who has no baby and would like to borrow a "holy innocent." Big families with their wealth of babies might lend one to reign over childless households for a day. In some places children were spanked to remind them of the sufferings of the Innocents. We do not do this, but we do tell the story of their martyrdom and the madman Herod who valued life so lightly that he could order the slaying of his whole family, even his three sons. So why not the sons of others? Why not, if necessary, the Son of God? There was a saying: It is better to be Herod's pig than his son. As a Jew he could not eat pork; so he would not kill his pig. Dom Chapman wrote with gentle humor: "I drank milk all day in honor of the Holy Innocents." That name for which they died, they did not know. . . . These Innocents hat simply picked up in the scuffle The kingdom of God and eternal life. . . .
Let us pray. O Lord, Jesus Christ, Who didst embrace and lay thy hands upon the little children when they came to thee, and didst say to them: "Suffer little children to come unto me, and forbid them not, for the kingdom of heaven is theirs, and their angels always see the face of my Father," — look with a Father's eye upon the innocence of these children and their parents' devotion, and bless them this day through our ministry. By thy grace and goodness let them make progress in desiring thee, loving thee, fearing thee, obeying thy commandments — thus coming to their destined home, through thee, Saviour of the world, Who with the Father and the Holy Spirit livest and reignest, God, forever and ever. Amen. For parents there is the beautiful blessing of children for use at home: "Bless you, my child, in the name of the Father, and of the Son, and of the Holy Spirit." It is a custom to add some loving petition such as "and may you have a sweet sleep"; or if a child is sick, "and may you be better by morning"; or if a child is anticipating some special occasion, something like "and may you have a lovely feast day tomorrow." The father or mother places one hand on each side of the child's head as the words are pronounced and accompanies the invocation of the Trinity by making the Sign of the Cross with the right thumb on the child's forehead. It makes a beautiful end to a day, and it is an added source of confidence when starting on a journey, off to school, before exams, to the doctor, to the dentist — anywhere. Let us who are parents ask our parents to give us their blessing.